Tools don't make an artist great. But, there is a right tool and a wrong tool for the job, and having right tool makes the job a whole lot easier. I've been at this for nearly 10 years, and I think it's appropriate to share my thoughts on gear. The easiest way to start is to show you what I play. This is my main guitar, and it is amazing. 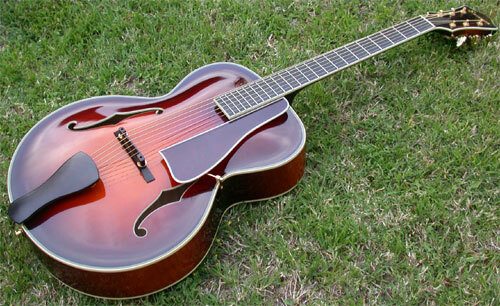 It is a 16" non-cutaway archtop in the original L-5 style, except that it is X-braced. Cutaway guitars always have less acoustic response, and so this guitar has nothing to limit it's acoustic potential. 16" archtops have less fullness and roundness than 17" archtops - and in a band setting, I find that extra lows and low mids are covered up and lost. 16" guitars are more like a knife, slicing through between the bass/bass drum and the horns/right hand piano. 16" guitars seem to carry more, since there's less boominess to have to project. I'm big on vintage aesthetics, so the original "chuck wayne" style pickguard had to go. 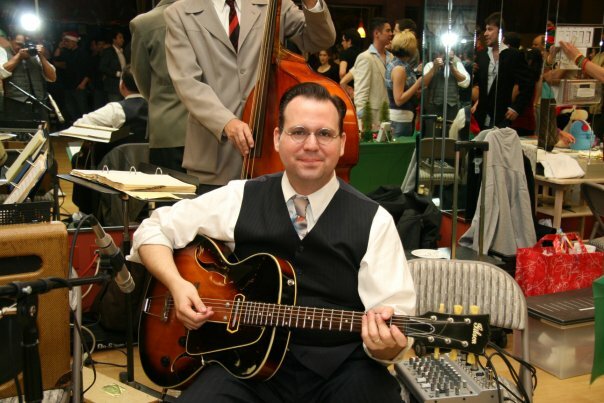 I replaced it with a guard from www.archtop.com, which is modeled one from a pre-1935 Gibson L-7. At times I have used a DeArmond Guitar Mic floating pickup, but I haven't found a way to mount it that would allow the guitar's top to vibrate freely. The guitar is so amazing acoustically, and it's really a shame to interfere with that. Finding a new non-cutaway archtop is pretty hard nowadays, and Eastman is a fantastic choice. I found this guitar at Buffalo Brothers in San Diego. It was unusual guitar - Petite Bouche guitars are 14-fret, while Grande Bouche guitars are usually 12-fret. 14-fret Grande Bouches are a fairly common hybrid, but going the other way is almost unheard of. The guitar is insanely figured, with a bearclaw spruce top, and bird's eye maple back, and aa flamed maple neck. Honestly, figured woods and short scale are not really my thing, but it's a great guitar and I got a great deal, and so it's been with me ever since. 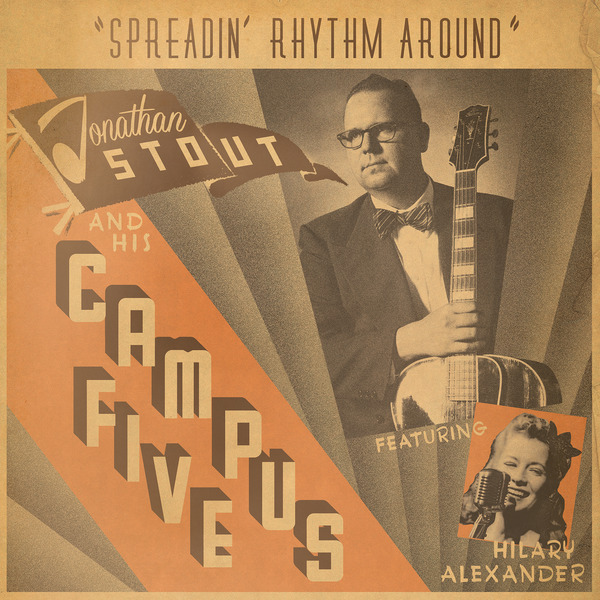 I play it on Django-type songs with the Campus Five, and because of it's higher timbre, I sometimes use it when I need to fake a banjo. The original owner asked for both a Highlander pickup and a McIntyre Feather pickup. Neither really sounds that great, and so I always just mic the guitar. This guitar was a strange ebay find - a wonderfully strange ebay find. The original owner apparently decided to take a mid-90's Washburn HB15 and make a Gibson EH-150 clone out of it. The pickup is a vintage CC pickup that was refurbished, so not all of the pick up is totally original. The original owner did an amazing job of cloning a Gibson - he reshaped the headstock, put on the Gibson logo, added vintage knobs, and the right pickguard. But of course, I really care about the sound - and it sounds awesome! I had been dissatisfied with my electric tone for a long time, and using this guitar was the first time I was satisfied with my electric tone in a long time. Tone, especially electric tone, is an important part of the equation. The ideas that come into my head and fingers are directly related to the tone coming out of the instruments. Most jazz boxes have humbuckers, and that tone has stopped doing it for me. 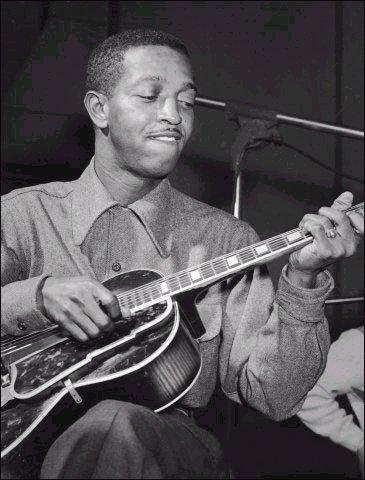 The sound of a CC pickup really allows to channel Charlie Christian - which is exactly the kind of sound I'm after. My main amp is a 1939 Gibson EH-185. 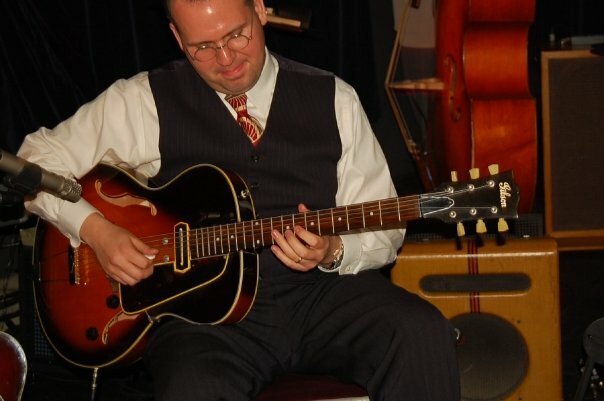 It's a transitional model from 1939, and it's actually label as an EH-150 (at the time Gibson was going to be replacing the 150, instead of adding another model). It has mic and instrument channels, and master treble and bass knobs. My bass player, Wally Hersom, went over the electronics and refreshed them, replacing some blown caps, but its otherwise all original. It's surprisingly durable, despite being over 70 years old. Everything I said about CC pickups when talking about the Washburn goes double when plugging one into a real CC amp. I worry about the amp, so right now I'm considering cloning it. The first hard part will be getting all of the electronic components for the amp circuit, but the second hard part will be finding a vintage field coil speaker. I think the field coil speaker is an integral part of the sound of these amps. On all of the archtops I use .013 gauge sets, but I swap out the high E and B strings with a .014 and an .018. On the Eastman, I use Martin SP 80/20 strings. 80/20 strings sound warmer and more vintage than Phosphor Bronze, which is much more common nowadays. On the electric I just use regular old D'Addario Nickel. 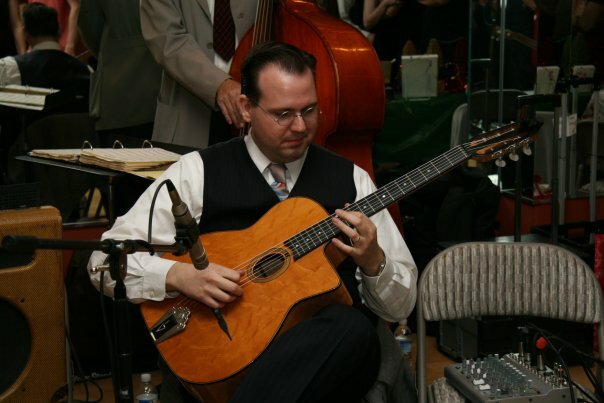 For the Selmer-style, I use either real Savarez Argentines (.011 gauge), with ball ends. While I really don't have any tonal concerns about ball vs. loop end, I get ball so that I can use the strings on another guitar if there's an emergency. I go back and forth on picks between the Wegen Fatone and the Red Bear New Tortis. The Fatone has amazing power and fullness, and is essential when playing in less than ideal acoustic situations. Alternatively, I use the Red Bear Tortis (GJ size, standard bevel, B shape) especially for chord melody stuff, Allan Reuss-style solos, and the like - basically anywhere where I don't want to be slamming the strings into the fingerboard. The Red Bear is brighter and cleaner than the Wegen. I definitely do NOT like the "speed bevel" that can be ordered on the Red Bear, it makes the tone way too bright and thin for my taste. Photo by Samuel ChanI'm a purist, yes. And that means I play acoustic guitar into a microphone - a pretty darn good microphone actually. The Rode NT-3 is the perfect mic for what I'm looking for. I need a condenser mic, because dynamic mics are generally made for vocals, and have far too much of a "proximity effect" (artifically increased bass response, increasing exponentially in relation the closeness of the sound source). That proximity effect sounds great for vocals, but not on already boomy archtops. Further, even if you eq out the proximity effect, dynamics loose volume exponentially if you move away from them - which means shifting in your seat could cause significant volume shifts. Condensers are far more forgiving regarding positioning. There are feedback issues with condensers, and I have developed strategies for dealing with feedback. It's well worth the trouble, because the tone is outstanding. I've had non-guitar playing musicians in the band give me complements on the tone my guitar coming through the PA. Unlike a regular small diapraghm "pencil" condenser, the NT-3 is internally shockmounted, so it has a minimum of handling noise. Also, it does require phantom, but it has a battery compartment, so you plug into a system that doesn't provide phantom - this is very helpful when plugging into an acoustic guitar amp for smaller gigs without a PA. Finally, the NT-3 has an on/off switch, which seems like an ameteur level feature, but I find it to be essential. The NT-3 picks up a lot when you're not playing guitar through it, and especially in between songs it can amplify all of the stage conversation. More over, I often have to lean forward to turn pages in our book, which could mean leaning into the mic, and causing feedback. Having an on/off switch is an easy solution to that problem. Plus, it means not having to count on the sound guy to turn you off.